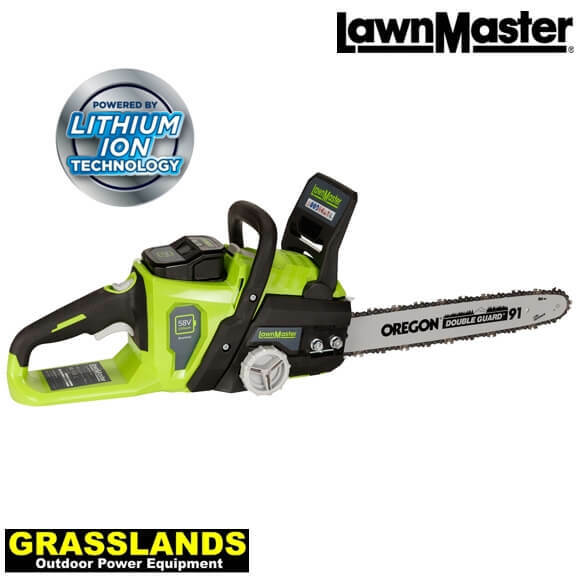 The first advantage of using a LawnMaster 58v chainsaw is no more smelly oil & petrol because it is powered by a lithium iron battery. As a result of this you get easy no hassle starting, just pull the trigger and start cutting. It really is that easy. 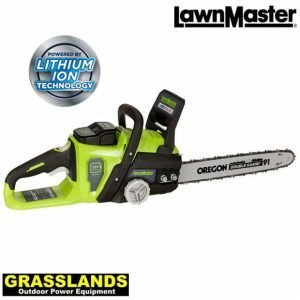 The LawnMaster 58v chainsaw is powered by a 58 volt lithium battery that give up to 40 minutes of cutting time depending on the conditions hence is suited to home & lifesyle users. This chainsaw comes complete with a 4 A/H battery and charger unit. The saw if fitted with a 16" Oregon bar & chain. The saw is fitted with tool-less chain tension adjuster. Lithium battery powered - the future is here now!